A volume in the series: Adult Education Special Topics: Theory, Research and Practice in LifeLong Learning. Editor(s): Kathleen P. King, University of South Florida. 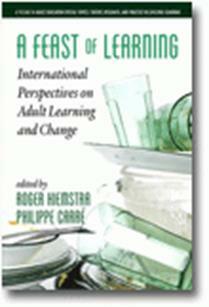 This book provides perspectives from authors in six countries (Canada, Colombia, Germany, France, UK, USA) pertaining to adult learning in the 21st Century. This book grew out of an exciting International Conference on Adult Learning (ICAL) held in Paris, May 27-29, 2012. Imagine “listening in” as these international scholars, representing expertise in various areas related to adult education, focus their collective attention to the topic of adult learning. Their task is to concentrate their research and intellectual acumen on where adult learning is heading in the 21st Century and to bring together their varied areas of expertise to expand the field of adult education’s knowledge base. This book provides more than a record of their papers and meetings. Instead, each author has revised their paper with symposium feedback to help capture the discussion, synergy and growing knowledge base we envision together. Now you can read how these leading scholars understand adult learning in light on their collective work. This book will benefit teachers, researchers, administrators, and students in the field of adult education, learning, and practice. The synergistic result of bringing together nine scholars results in many new practical applications, research streams, scholarship, and practice suggestions. Foreword. Acknowledgments. Introduction: The Learning Priority, Philippe Carré and Roger Hiemstra. Heuristics of Adult Learning, Philippe Carré. Facilitating Adult Self-Directed Learning, Roger (Rog) Hiemstra. Placing Individuals at the Learning Process’s Center to Increase Organizational Training’s Impact, Jean-François Roussel. Hypothetical Model for Executives’ Self-Development, Käthe Schneider. Identifying Challenges for Distance Learning: Quality, Design, and Facilitation, Kathleen P. King. Promoting Self-Directed Science Learning for All: Beyond the Scientist/Nonscientist Social Divide, Olivier Las Vergnas. Entertainment-Education Communication Strategy: An Alternative Way to Learn, Jesús Arroyave. Transforming Education From the Inside Out: Positive Deviance to Enhance Learning and Student Retention, Arvind Singhal. Learning through the Life Course: Social Policy vs. Individual Agency, Karen Evans. A Veritable Knowledge Feast, Roger (Rog) Hiemstra and Philippe Carré. About the Editors. About the Contributors.